Renting accommodation in one of our residences requires the signature of a one-year agreement. However, you are still entitled to cancel it at any point for which a one-month notice period is applicable. If you only need accommodation for a few months, that is also an option. You are of course entitled to invite friends to your apartment. This should nevertheless be an occasional arrangement... after all, we have accommodation designed to be shared on a permanent basis! Life in a big city certainly has its advantages but we have to confess there are also a few drawbacks.... starting with high rents. This is why flat shares are a good and also sociable way of reducing your outgoings. Would you like to share an apartment? Our two-br and three-br apartments are perfect for this. If you’re still unsure where life will lead, you are able to pre-book apartments in different cities, via our site. 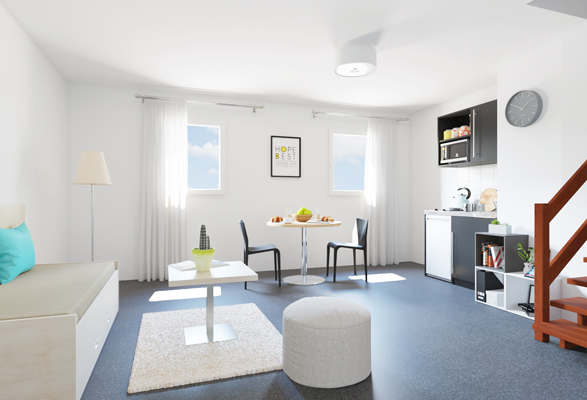 Accommodation is then reserved until a given date which can be arranged with residence managers.